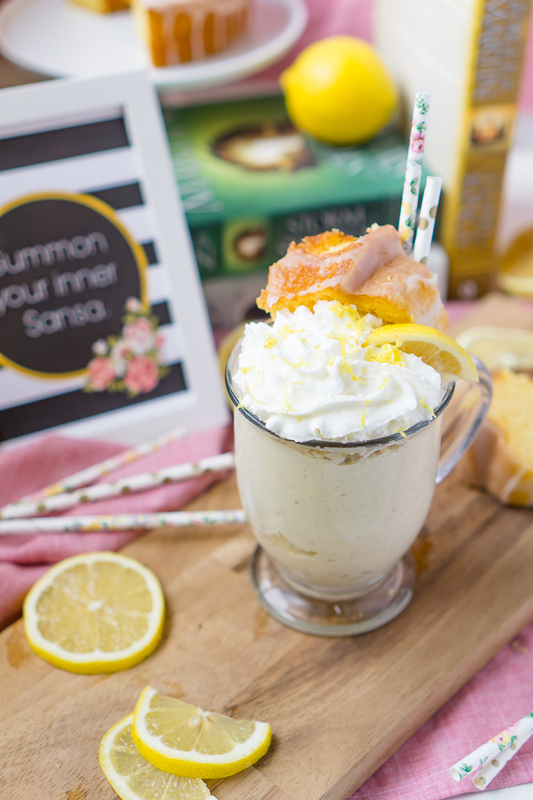 You don’t want to miss our latest Game of Thrones Inspired Recipe – Sansa’s Lemon Cake Milkshake Recipe! A light citrus milkshake that’s refreshing and satisfying for the entire family that you’ll all love all year round! 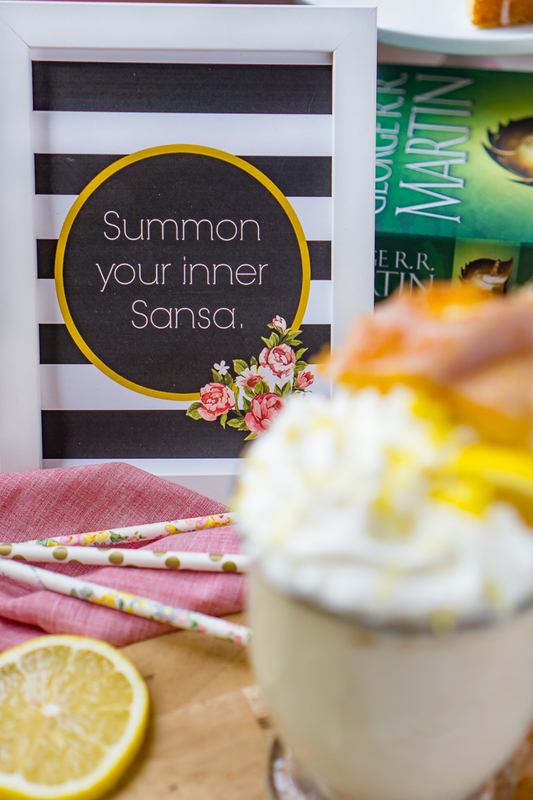 You won’t want to miss our latest Game of Thrones Inspired Recipe – Sansa’s Lemon Cake Milkshake! I can’t believe it’s already been over two years since I shared my Game of Thrones inspired recipe for Sansa’s Lemon Cakes and how many lives we have lost to George R.R. Martin’s cruel creativity! If we don’t lose someone or something else in tomorrow night’s GOT season 7 finale (I’m looking at you The Wall! ), I will be shocked. So before all the anxiety from a newly created Ice Dragon (who I’m honoring with his own Ice Dragon Cocktail), fear from losing characters we love, and general heart palpitations that come with an hour of Game of Thrones, I thought we would lighten it up around here with Sansa’s Lemon Cake Milkshake. Since we are also talking about Sansa, I really wish we could all move on from the Sansa hate because I’m hoping they are going to redeem her in some awesome way. The great thing about Martin’s world in Game of Thrones is that we get a wide collection of characters that we both love and love to hate with some characters swinging dramatically both ways depending on the episode. Jamie is that character for me. I know he’s problematic but I’m keeping my fingers crossed that those Lannister brothers make it out of this alive together. Cersei – you’re going down! Sansa, however, always seems to be criticized no matter what she does. Bryan tends to give her a lot of crap and give Arya his undying devotion. Well – I’ve decided to hold down the Team Sansa fort in this house because I’m pretty sure Arya might just be a psychopath. Sansa has potential! Yes, Sansa was incredibly naive and far too trusting in the beginning. She grew up in a sheltered life at Winterfell, far from the back stabbing, murderous court in King’s Landing. Yes, the writers’ have continued to limit her growth with her wedding night scene being the worst abuse of the story and her development. Interested in this print? Buy It Now! But she is also sassy and smart, taking all the hardships and getting tougher. She won back Winterfell with her diplomacy and has made some really good points to Jon this year that he just continues to ignore! 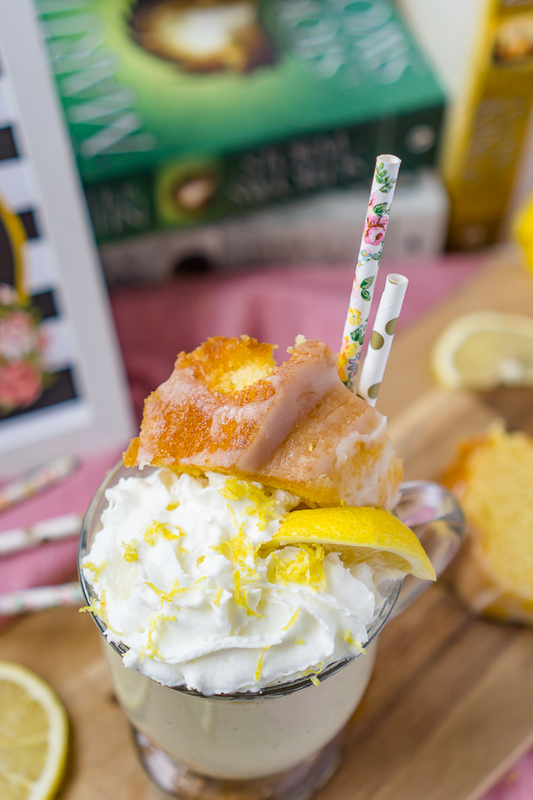 So I think we all need to enjoy this Sansa’s Lemon Cake Milkshake Recipe and give her some slack while also hoping the writers finally let her be as awesome as she could be! I mean, we all want her to take down Littlefinger, right?! Alright, time to stop nerdying out and get to the recipe for Sansa’s Lemon Cake Milkshake! If you love lemon, this recipe is for you! 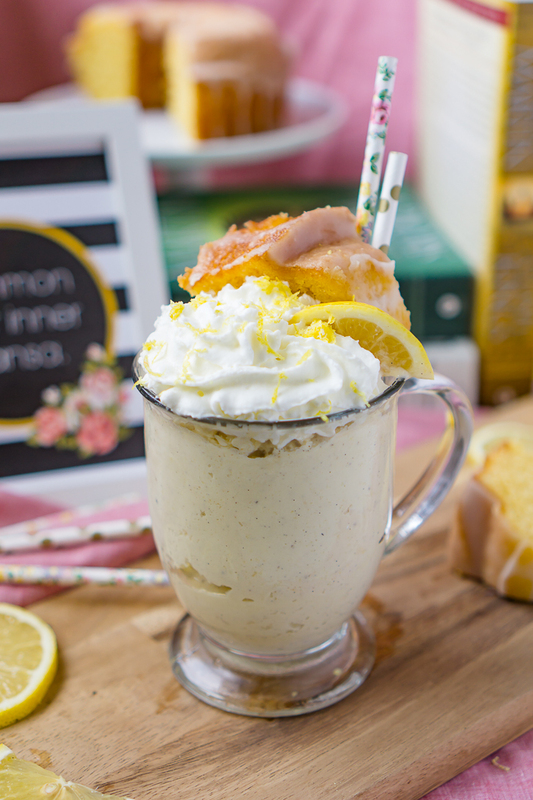 It’s light, refreshing and so creamy with the edition of lemon cake inside the milkshake. I highly recommend whipping up a batch of my Sansa’s Lemon Cakes which are a citrus sponge cake, but any lemon cake will serve for this recipe if you are in a rush for tomorrow night’s finale. My husband loves this milkshake as written below, but if you are lemon obsessed like me, you might want to consider adding in some lemon zest and even using some lemon ice cream instead! Looking for a boozy version of this milkshake? Check out Sansa’s Lemon Cake Cocktail at Sugar & Soul! Now Let’s Blend Up this Family Friendly Game of Thrones Milkshake! 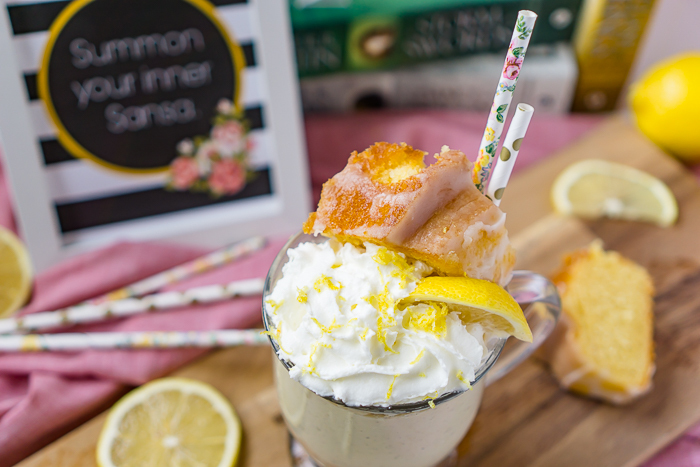 You don't want to miss our latest Game of Thrones Inspired Recipe - Sansa's Lemon Cake Milkshake Recipe! A light citrus milkshake that's refreshing and satisfying for the entire family that you'll all love all year round! Add the three ingredients into the blender and blend on highest setting until smooth, about one minute. Pour into glass and enjoy!